Interior includes a graceful spiral staircase and very high style Greek Revival door and windows trim in stair hall and left front room. Doors also have some decorative painted graining. 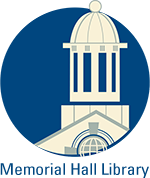 Themes - Architectural and Community Development. 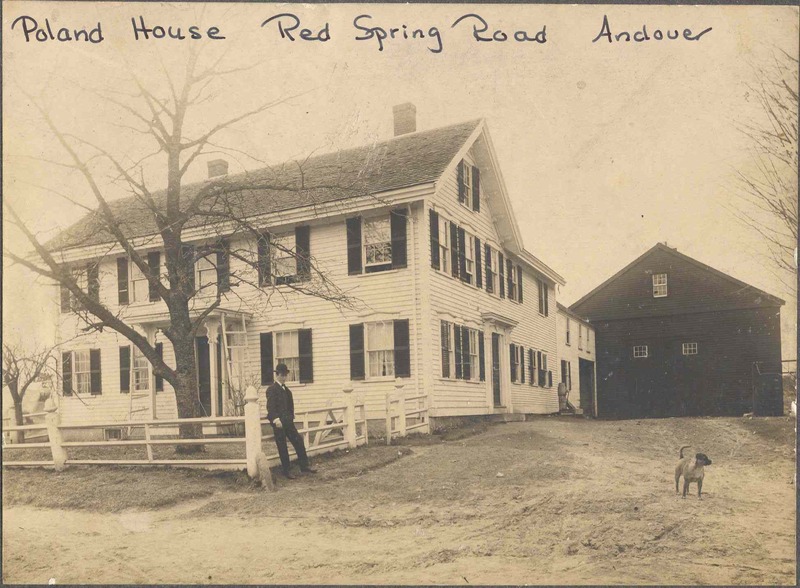 The two houses at 51 & 53 Red Spring Road were built about 1820 by brothers, Abel & Paschal Abbot of Andover. The brothers were partners in cotton manufacturing and began operations in the North Parish of Andover in 1812. Abraham Marland, also a cotton manufacturer in the South Parish since 1807, bought a third interest in the Abbot Mill in 1813. The Abbots sold their mill in 1814 and moved the operation to (what would become known as Abbot Village) the South Parish. The Shawsheen River was a swifter and more reliable water source making it more suitable for manufacture by waterpower. They built their wooden mill on the west side of the river where it remains to this day. Abiel Russell was the first foreman of the mill and lived on Cuba Street. He was also the brother-in-law to Abel and Paschal, his wife Sarah Abbot being their sister. Abel & Paschal parents were Nathan Abbot Jr. and Sarah Ballard, and two of thirteen children. 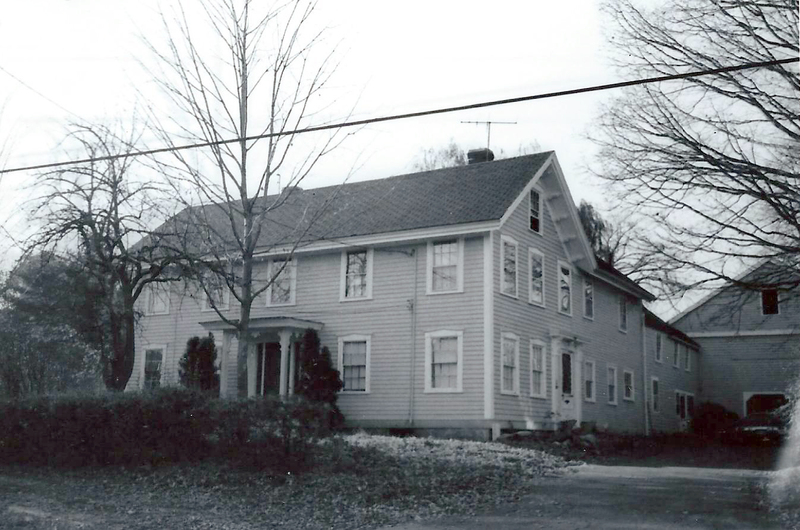 All were part of the prolific Abbot family of Andover and direct descendants of George & Hannah Abbot and their son Benjamin and Sarah Abbot who built the homestead at 9 Andover Street. Paschal Abbot was born July 23, 1788, married October 11, 1810 to his first cousin Mary Foster Abbot who was the sister of Abel’s wife Sara and daughter of Job & Anna Abbot. Paschal’s wife Mary F. died of consumption on October 27, 1828 age 37. They had one daughter; Mary b. June 21, 1814. It has been stated that they often entertained students from the Phillips & the Theological Academies. After the business failed in 1842 due to a down turn in the economy Paschal and Hannah removed from Andover and the church on September 22, 1845 to the First Church, Norwich, Conn. A short time later they moved to Dexter, Maine where they lived out their remaining years. Paschal died in March 1859 and Hannah in 1883. Both were buried in the Dexter, Maine cemetery. Three other Abbot brothers, Jeremiah, Amos & Joshua had established a successful mill in Dexter in 1820. The investors took the mill properties and then sold to Smith & Dove Manufacturing Co. in 1843. The two brother’s homesteads and farm containing 73 acres with three houses and barns at #51– #53– #55 Red Spring Rd. was purchased by Abel & Paschal’s brother, also a creditor, Job Abbot in April 1843. Most of their 73 acre farm property is now the campus of Andover High School. Job Abbot was the second son of Nathan & Sarah Ballard Abbot and older brother to Abel and Paschal. Job born in Andover on August 7, 1782 and married Lucy Chandler of Concord, N.H. int. recorded October 9, 1807. The couple joined the South Church on November 6, 1831. Job sold the homestead to his son Amos Abbot 2nd in July 1847 for $100. Essentially a wedding gift, Amos lived at #51 with his new bride Lydia H. Blanchard age 18, daughter of Abel and Elizabeth Blanchard of Andover. The property was divided up at this time and the two houses at #53 & #55 were separated from the original farm and were reserved for Abel & Mary Abbot for the remainder of their lives. Amos would later be gifted the other property in 1856. Amos was a farmer and held the 72 acre farm until Feb. 1869 when he sold to John & Phebe Chandler. Amos and family then settled in Kansas. John & Phebe R. Chandler - 1869–1885 - #51, #53 & #55 Red Spring Rd. John Henry b. Feb. 15, 1840, George Warren b. June 5, 1842, Ann Elizabeth b. 1844, bapt. September 28, 1845, and Emma baptized May 6, 1849. The Chandler’s occupied the house at #51. John was originally a farmer but began a wood and coal business in 1870 on Main Street. At age 70 in 1882 he sold his business to his son George. Chandler rented out the other two houses #53 & #55 on the second parcel of property selling them to David Bruce in 1888. Peter Dove Smith purchased the house and 72 acres of land west of the road from John Chandler in April of 1891. Peter D. Smith was the son of Peter Smith, co-founder of the Smith & Dove Manufacturing Co. of Andover, Mass. After his father died in 1880 he became President of the company. The Smith Family were the wealthiest residents in Andover and owned several estates in town. The house at #51 was bought as an investment property. The house was transformed from its original ell shape Greek Revival style to a more grand Italianate look with deeper bracketed eaves and a new addition to the main house on the left. A beautiful spiral staircase in the front entry replaced the former steep square box style. 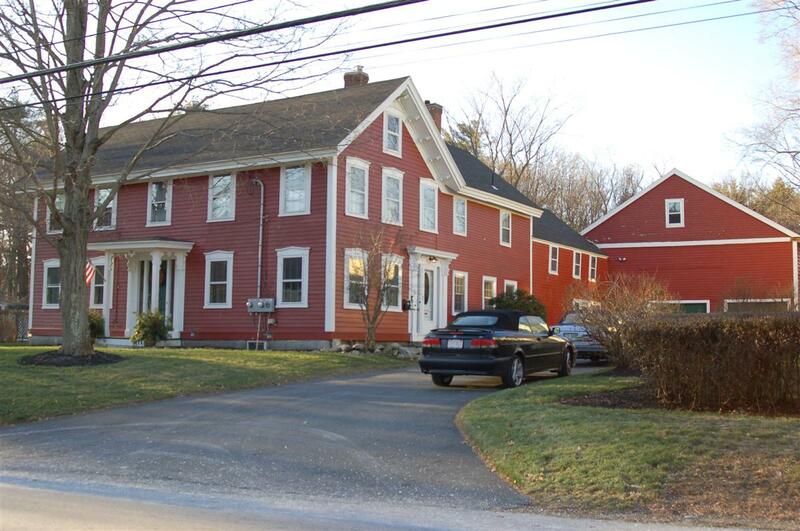 The home was converted to a two family residence during Smith ownership. The house was then rented to employees of the Smith & Dove Co. The Townsman reported in 1891 that at the end of May the house would be occupied by William Angus and William Greig. Through the years that followed from 1897 to about 1920, two families called this home; James & Helen Poland and James & Mary Stewart. Poland, a flax dresser, and Stewart both worked for Smith & Dove. Several of their children also work at the mill and others with the Tyer Rubber Co. The John Hackney family later moved into one of the apartments. Their sons were all connected with golfing clubs and played the pro circuit. After Peter D. Smith’s death in 1910, wife Abby retained the house until her death in 1921. William was employed for many years as a teamster for the Smith & Dove Co., then as a stationary fireman. Later he went to work for Phillips Academy also as a fireman. William’s first wife Helen died on October 7, 1917. William remarried to Wilhelmina Bateson, a housewife and widow. James Bateson was born in Belfast, Ireland in 1905 and his wife Eliza Jane Smith was born in Arbroath, Scotland in 1905. They were married on September 3, 1927 by Rev. Wilson of the Free Church. Jim was a member of South Church for 60 years. He was a machinist, truck drive and chauffeur and worked for the Marland Mills Company, later the J. P. Stevens Co. where Eliza worked as a mender. The couple lived in the house for twenty years, first as tenants of Jim’s mother and step-father and then owners. They had two children, a son James Bateson Jr. b. 1928 and Eleanor b. 1932. Dorman, Moses: Map of Andover, 1830. Bailey, Sarah Loring: Historical Sketches of Andover, 1880. Able & Paschal Abbott - Apr. 5, 1822 - b. 232 p.5 - Indenture Trust Stephen Abbot. Abbie C. Smith - Jan 16, 1911 by probate will of Peter D.